BANG! BANG! BANG! The knock at the door sent reverberations through the night sky and deep into the foundation of the church. The first nail was driven into the coffin of the Catholic Church. The parchment hung for all to see. It was a simple note but it would turn out to be the Pope's worst nightmare. The story begins in 1483. The printing press was invented 30 years before (see All In Due Time), the Spanish Inquisition was 3 years old (see The American Inquisition), and a decade before Columbus braved the uncharted seas (see What Is Columbus Day?). The birth of Martin Luther was not an extraordinary one, but it was one that would impact the world forever. A devote Catholic, Luther never even read the Bible until a Latin class in college. In those days Bibles were exclusively in Latin. Only priests, monks and some universities had access to them. Due largely to the fact that each Bible was handwritten, it took years to produce a single copy. Well on his way to becoming a lawyer, Luther was not seeking any position in the church other than a seat in a pew during Mass. That all changed during a thunderstorm. A bolt of lightening struck dangerously close to Luther, overwhelming him with fear. He vowed to devote himself to God if his life was spared. His prayer was answered. Even though it was tearing him apart to leave law school, within a matter of weeks he had left the University of Erfurt for the monastery to fulfill the promise he made. Luther was not an enthusiastic monk at first but he was determined to move forward with this new chapter in his life. While at the monastery Luther was able, for the first time, to really study the Bible. Luther spent hours fasting and praying trying to feel forgiven of his sins. He would even sleep naked on the floor, basically torturing himself, trying to earn salvation. Nothing Luther did, no good work, would bring him the comfort and freedom he was searching for. Nothing he did seemed to be good enough. With prodding from his vicar, Luther extended his studies to become a priest as well as a Doctor of Theology. When a monk in Saxony decided to peddle his indulgences, Luther was compelled to address it. Feeling that indulgences were evil, Luther took the occasion to write 95 theses, or arguments, against indulgences, good works, the papacy, and other relevant theological issues. He posted his theses on October 31, 1517, on the town bulletin board which was the All Saints’ Church door in Wittenberg where he was a professor at the University. Initially Luther's statement did not gather much attention. It wasn't until three months later, when some of Luther’s friends translated the 95 theses into German from the original Latin, did word begin to spread. Using the relatively new invention the printing press, copies were printed and circulated throughout Germany within two weeks, in two months throughout all of Europe. It was one of the very first times the printing press was used to forward a movement. A fire was ignited that could not be extinguished. Only wanting to open debate, Luther found himself in the middle of a war that seemed one uphill battle after another. An inquisition was brought upon him which could mean his life. 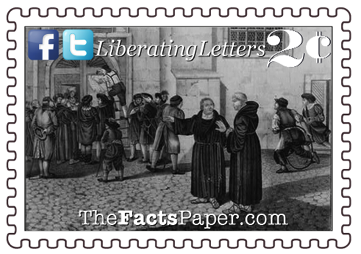 Refusing to recant his statements and writings, Luther was eventually excommunicated from the Catholic Church. Fearing for his life he was forced to go into hiding for a year in Wartburg Castle. His confinement proved to be a blessing. It was here that Luther translated the Bible into German. With help of the printing press, millions of commoners were given the ability to read the Bible for the first time in history. After years of study and despair in his ability to do enough works to justify his salvation, Luther found the answer he was craving. “For in the gospel the righteousness of God is revealed--a righteousness that is by faith from first to last, just as it is written: ‘The righteous will live by faith.’” Romans 1:17 It was this verse that revealed the true grace of God our Father and the gift of our Lord and Savior Jesus Christ. It is by faith alone that saves us. Faith in Christ, his death on the cross and his resurrection freed us from the chains and punishment of sin. This revelation sent Luther back through the rest of the scriptures, focusing on the Psalms and Paul’s writings, for more explanation and clarification. He realized his Catholic faith was a religion of works based salvation. The Catholic Church had decided that the people could purchase God’s appeasement, buying their way out of temporal punishment for their sins by prayer, good works, but mostly by money. Luther realized forgiveness of sins is set purely and completely on the shoulders of Christ. It has all been forgiven through grace. Indulgences were just a form of tax the church put on the people to raise money. One could compare it to the money changers in the temple that infuriated Christ causing him to overturn tables. The leadership in the Catholic Church had become a den of thieves. Luther came to realize that Christ destroyed the wall that stood between God and his people. As our mediator Christ allowed people to have direct, personal access to God. Over several centuries the Catholic Church rebuilt and expanded the wall that separated the people from God. Congregants were required to pray to Mother Mary along with appointed Saints for every issue at hand. Luther realized this was a complete denial of Christ’s purpose. If one could access God through someone other than Christ, or if they could earn their own salvation, than what was the purpose of Christ’s death? Luther broke down this false wall, revealing Christ as our personal access to God. He wrote a new mass and hymns. Utilizing everything to teach God’s Word, Luther used direct Biblical verses to write hymn lyrics as well as prayers and chants during the service. Though Luther was in no way the only leader in the Protestant Reformation, he was the most well known. He tried to compromise, hoping to build a unified faith. Following a disagreement with Ulrich Zwingli of Switzerland on the sacraments, Luther could no longer deny his understanding of God's Word. He did find agreement with many others and together they composed the Book of Concord which is the foundation of the Lutheran doctrine. He also wrote the Large Catechism, an in-depth explanation of God’s Word, along with the condensed Small Catechism, which was designed for parents to use to teach their children. Liberty, we celebrate Reformation because it is the movement that gave rebirth to the Gospel of Jesus Christ. It opened our eyes to the truth of justification by faith alone. Up until this point those in the Roman Catholic Church were forced to believe whatever the priests told them as they had no access to the bible themselves. Because of Luther's German translation and the ability to mass print Bibles, we are able to read, mark, learn and inwardly digest God’s Word directly. This is partially why the copies of his 95 theses were so quickly absorbed throughout the area. Many felt the burdens and guilt imposed by a works based faith. The peace they received from a salvation from grace by faith allowed them the freedom to love their God without shame and without fear, worshiping Him out of pure and honest thanksgiving. I am not condemning Catholics, I am describing the faults of the church leadership and Luther’s attempts to correct it. Just as I can do that, though, Catholics can find many statements from Luther that could convict him as well. To which I would say “He is human. Of course he had faults.” Luther himself was well aware of his sinfulness and inadequacies. He never wanted to start a new faith and definitely did not want that new church to be called Lutheran. He believed anyone following Christ’s teachings should be called simply Christian. As he so eloquently stated, “The first thing I ask is that people should not make use of my name, and should not call themselves Lutherans but Christians. What is Luther? The teaching is not mine. Nor was I crucified for anyone…How did I, poor stinking bag of maggots that I am, come to the point where people call the children of Christ by my evil name?” Which is why, Liberty, you can not blindly follow anyone other than Christ. We are Lutheran’s because we believe he correctly taught the true meaning of the Bible. We in no way worship him or put his writings over the Bible. We compare for consistency and if there is a discrepancy than the authority of the Bible should always win out. Luther’s goal was to return the Catholic Church to the Theology of the Cross. Once removed from the church, he chartered a new course to preach the true Gospel of Jesus Christ. (see Here I Stand) Despite his objections, a denomination did emerge using his name only to distinguish itself from the other Protestant churches beginning to develop. Under the Roman Catholic Church, the task of interpreting the Bible fell squarely on the shoulders of the Pope. It was not uncommon then for the church to change it’s beliefs when a new Pope was appointed. As people started breaking from the Catholic Church, the freedom to interpret the Bible was embraced by others and not left to only one man. People could then follow which understanding they believed to be correct. So as you dress up on this day in cute little outfits, knocking on doors for candy, remember the knock that revolutionized faith for Christians over 500 years ago. For believers this day is not just about costumes and candy, it is also a day of liberation. It gave freedom to the world to not only have a choice but an active role in their faith. It is because of Luther we have direct access to God’s Word. It proves that one man can make a difference. One man can change the world.